Dogs don’t judge when you read aloud! 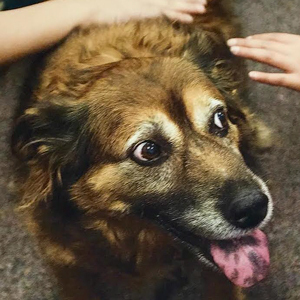 In honor of The Shadow Project’s namesake, Shadow the dog, whose birthday is Feb. 14, we asked a few of our students with learning challenges how reading to their dog gives them confidence. Many children with learning challenges such as dyslexia and ADHD, or kids with anxiety, are afraid to read out loud in front of their peers for fear of ridicule. 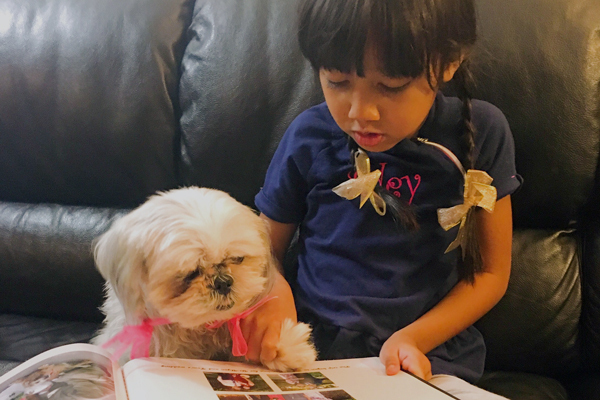 Reading aloud at home nightly is one way to get over this worry, and many Shadow children rely upon their dogs as reading buddies, to boost courage … and reading comprehension. Fifth grader Mia dislikes reading out loud in class because she reads slow and fears people will laugh if the letters move around on the page, and her words falter. “I was always nervous to read out loud,” said Mia, 10. But Milo—one of her two dogs—loves for Mia to read to him. “She likes reading to the dog because he doesn’t judge,” said Sarah Drummond Hays, Mia’s mom. Educators say that dogs make great reading partners because they can encourage students with a gentle nudge to keep going, or a paw placed strategically to offer support and enhance focus. Dogs also have a calming effect that can reduce anxiety, and their quiet presence boosts confidence. Fifth grader Adam likes to read to his dog, Molly, because she is a good listener … and doesn’t interrupt with questions. “I just love dogs,” he said.